Redlands laws can limit RV owners as to where they can store their vehicles. Many neighborhoods do not allow homeowners to leave their RVs parked on the streets or in their driveway. By considering indoor self-storage facilities, such as those in the Redlands, RV parking not only becomes legal, but is also a great way to ensure their investment is cared for and protected. When shopping for a self-storage facility for your RV, you have one of two choices; you can store the RV inside of a facility, or you can consider Redlands RV parking outside. Parking your RV outdoors is an option, but it can also damage your investment. Sun damage can result in faded exterior paint, while hail damage can be expensive to repair. Indoor facilities are best to provide the ultimate in protection. Considering a secure facility is a huge benefit when looking for RV storage. Security cameras and staff can ensure that those who have access to the facility are addressing their own personal items and are not tampering with others. 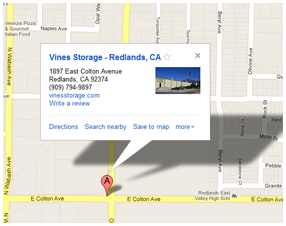 Vines Storage of Redlands offers a highly secure facility for protecting business and personal goods and other large items stored on-site. Amenities are also a consideration when shopping for self-storage facilities. Vines Storage offers a number of amenities such as ice, water, air compressors, battery chargers, and a dump site, which RV owners can utilize with their paid monthly lease. Many storage facilities do not offer these amenities, which makes Vines Storage stand out from the competitors in the Redlands area. Do you want one of the best storage facilities for your RV? Call Vines Storage today to learn about our converted warehouse storage and the many ways we can make self-storage easy and affordable. We offer storage units of all shapes and sizes for business and personal needs, making us the ultimate consideration when it comes to storage facilities in the area. We welcome you to visit our facility and take a tour, while learning about the many benefits of working with Vines Storage in the Redlands.